* Square TMD-Display, Square TMD, TMD-Display One, TMD-Display View and TMD Plus include a new control of two objects that allows running different actions with short and long presses. It is available for individual and paired controls. See the device manual for finding out all the features. Is the KNX bus coupling unit built-in? Can I turn my x buttons TMD Plus or Square TMD into an another with different number of buttons? No, they are different devices with different hardware. The LED indicator status is not synchronized with the status of the system controlled by the coresponding TMD button. How can I synchronize them? In TMD series, the control and status of the LEDs is obtained through the same communication object. Thus, firstly, this object should be linked to the control group address and after that, to the status address. Is it possible to replace the printed glass of the Square TMD-Display, Square TMD, TMD-Display One, TMD-Display View and TMD Plus by another with a new design? Yes, but the change must be performed ​​in Zennio facilities, so it will be necessary to contact your Zennio distributor. Why when playing Scene nº X, the Group Monitor always show a minor number X-1? This is due to the particular structure of the "Scenes Control" DPT. For further information, consult the Scenes Example Project. How many Group Addresses do I need to work with Scenes? One only Group Address will be needed to work with scenes. Every device involved in the Scene has a specific Communication object "Scenes". It will only be necessary to link this with the "Scenes" Communication Objects in the devices involved in the predefined atmosphere. For further information, consult the Scenes Example Project. Is it possible to show the current scene in the display? Scenes are events, not status; while setting a scene, some predefined parameters are set in the devices involved in the same, however these can be later modified by the users. How can I learn scenes with the display? Once the scene is defined, every time we play it, a predefined atmosphere is generated. 1. Run the scene to be modified. 2. Turn the light we want it to be the guiding light On. 3. Just save the new scene into the Panel by keeping a long press (3 seconds) on the original scene "Run" button. Can I customize the design of my Square TMD-Display, Square TMD, TMD-Display One, TMD-Display View and TMD Plus? Can I use my custom icons in the design of TMD devices? Yes, you can upload to the application your own custom images from the Logo tab and then use them as icons. What image file formats can I upload to the TMD online tool for the design of my capacitive touch switch? Image file formats allowed: jpg/jpeg -gif – png – bmp. To take advantage of the transparent background layer, save your images using gif and png formats. TMD Plus, TMD-Display View and TMD Display One: 1016 x 1400 pixels. Can I design the Square TMD-Display, Square TMD, TMD-Display One, TMD-Display View and TMD Plus in my favourite photo editing application and then upload the image to the TMD web application? Can I preview the final design before issuing the print order? Yes, at the end of the design process, the TMD on-line application allow the user to generate a PDF file that shows the image that will definitely printed on the glass, so it has to be checked carefully before issuing the print order. Any anomaly detected in the image of this file must be reported to the Online Technical Support. Texts in the PDF file have a different size than those shown on the application, why? Browsers allow the user to adjust the font size according to its preferences; however, the on-line application for the design of the Square TMD-Display, Square TMD, TMD-Display One, TMD-Display View and TMD Plus uses the medium font size to generate the PDF file of the project. For this reason, it is necessary to set the font of your web browser to medium size when using the TMD design application. Which Zennio devices include binary inputs? A Switch/Sensor connected to an input, consists of an electrical mechanism which may have its contacts open or closed under normal conditions. These mechanisms don’t recover their normal position automatically as with the push button. A transition of a digital signal from low/high/low is called "Edge". Falling edge: Closed contact to Open Contact. Rising edge: Open contact to Closed Contact. What type of contacts can be connected on the binary inputs? Binary inputs of Zennio devices are voltage free contacts. 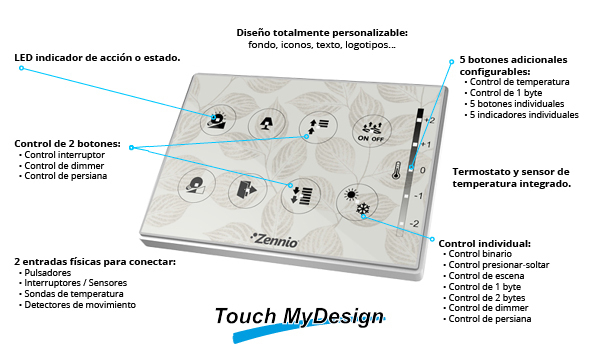 They can be individually configured and each of them can be connected to a push buttons and/or a switch/sensors. Can I connect several push buttons in parallel in the same input? Yes, inputs are voltage free, so there is no problem in connecting several push buttons in parallel. Why do I have to press twice over an input for the output to react? It happens when one output is commuted by two or more different inputs and the output status object isn't used to synchronize these inputs. What is the maximum length allowed for the wiring of the digital inputs? The wiring of the digital inputs can be extended up to 30 meters using a cable with a section between 0.15 mm2 and 1 mm2. What is the difference between motion detectors P (ZN1IO-DETEC-P) and X (ZN1IO-DETEC-X)? The only difference is that the motion detector P has a built-in luminosity sensor and it allows to constraint the detection based on the luminosity level detected in the room. The motion detector X has no luminosity sensor. Can I connect a motion sensor different from DETECT-P/X to an device input configured as motion sensor? We can’t guarantee the proper working of a different motion sensor connected to a Zennio device input configured as motion sensor, thus, when using a different motion sensor, the input must be configured as binary switch, and the sensor motion must send the detection using a free potential contact. To which Zennio devices can I connect a motion detector? Motion detectors can be connected to Zennio devices with analog-digital inputs. If you do not know if your Zennio device allows the motion detector connection, just look into the following table. For further information, consult the product datasheet. If the device allows the connection of a motion sensor, at its website tools section you will find the motion sensor manual. How can I know the position where the micro switch must be placed (Type A/B)? 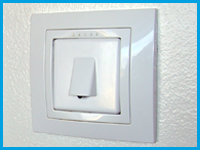 Depending on the device where the motion sensor is connected, the micro switch must be placed at the position A or B. To know which position corresponds to your device, it is necessary to check the device datasheet to which the motion sensor will be connected. How many sensors can I connect into the same input? Up to two different sensors can be connected in parallel to the same motion sensor input, as long as at least one of them has the luminosity sensor switch in the OFF position. This is achieved using the micro-switch located on the back of the device. For further information please refer to the motion sensor datasheet. Do I need an external power supply for the sensor? What is the detection area covered by a Zennio motion sensor? This feature depends critically on the location of the device. In particular, for a detector located in the ceiling of a room, the detection area can be doubled if you double the height at which it is placed. For further information, consult the motion sensor datasheet. How should I install the motion sensor to get the most of its functionality? In the Motion Sensor area, you can download the Installation Note that includes installation tips to find the most suitable place to be placed. The sensor sends a luminosity level in the range [1.....100] through a 1 byte Communication Objet. In any case this is a a 2 bytes object with the value measured in LUXES. Can we cancel the LED blinking everytime there is a detection? Yes, using the micro switch at the rear of the device. What is the maximum length allowed for the wiring of the analogue inputs? The wiring of the analogue inputs can be extended up to 30 meters using a cable with a section between 0.15 mm2 and 1 mm2. Check if the microswitch number 2 is placed in the correct position. You can find this information in the data sheet of the device to which it is connected. To which Zennio devices can I connect a temperature probe? Temperature probes can be connected to Zennio devices with analog-digital inputs. To know if a device has analog-digital inputs, look into its datasheet. What is the max cable length of the temperature probes? The probe cable length provided by Zennio is 1.5 meters, however, this can be enlarged by means of a cable with similar characteristics up to a maximum of 30 meters. What is the resistance value of the temperature probe at 25°? What are the valid measurement ranges for the temperature probes? What is the appropriate probe in my installation? It depends on the desired temperature range and the place where the probe will be placed. As described in the previous question, steel probes have a broader range of measurement and are ready to work in more extreme environments than epoxy probes. What is the temperature probe precision when it is used in QUAD? Can I use temperature probes different from the supplied by Zennio? Zennio devices were designed to operate according to the characteristics of our temperature probes. We can only guarantee the proper working of the device with Zennio probes. 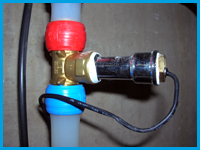 How can I install a temperature probe into a narrow plastic pipe? Use a T-shaped piece, take advantage of the new outlet to install a thermowell and now you will be able to place inside our steel temperature probe ZN1AC-NTC68S. How can I hide the ambient temperature probe on the wall? Install a conventional mounting box and uses a cable outlet cap. Place the temperature probe so that only its measuring end is seen. In this case we recommend using our epoxy resin probes ZN1AC-NTC68E and ZN1AC-NTC68F. Inputs number and type of each Zennio device. - Binary inputs: to connect push buttons/switches. - Analog-digital inputs: to connect motion sensors or temperature probes. Also configurable as binary inputs. *Inputs not available for luminosity sensor functionality. What does safe mode mean? When a device is running in safe mode the programming LED blinks in red, meaning that the application program is halted. How to set a device in safe mode? To activate the safe mode, keep the programming button pressed while connecting the device into the KNX bus. This process is described in the datasheet of the device. How to exit from safe mode? To exit from safe mode, simply plug the KNX bus into the device but do not press the programming button this time. This way the programming LED does not blink, meaning that the application program is running (safe mode is not active). How do a download in safe mode? Disconnect the device from KNX bus. Connect the device to KNX bus while holding down the programming button. The programming LED will start blinking indicating that the device is in safe mode. Once in safe mode, download the application program completely to the device. When the download is finished, disconnect and reconnect the device from the bus.